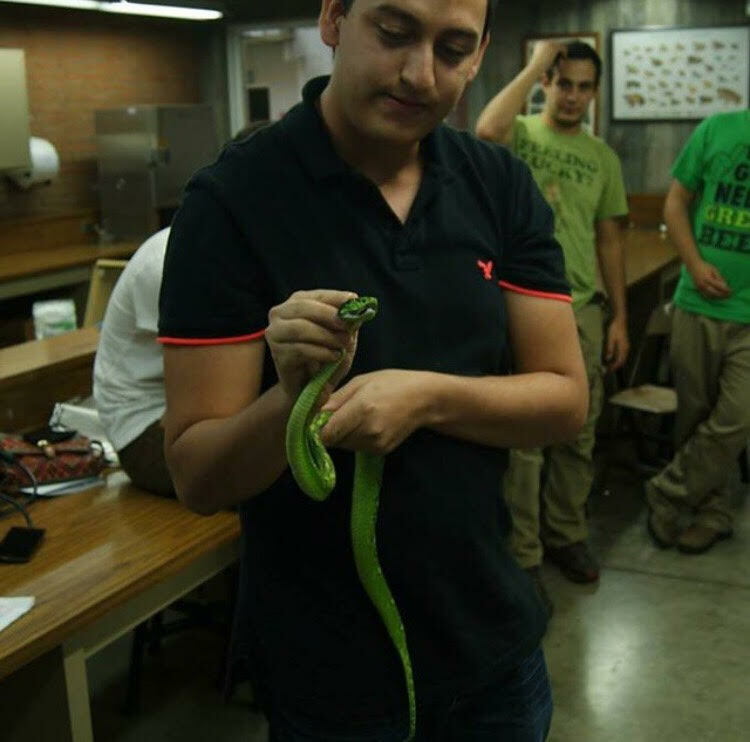 Real Scientists is in Guatemala City this week with Sergio Gonzáles (@BioloComunista), a researcher in herpetology, genetics, and conservation at the Center for Environmental and Biodiversity Studies at Universidad del Valle de Guatemala. We chatted with Sergio about his work so far. What got you into this really interesting line of research? I was born in Guatemala City and since my childhood, I’ve had an interest in Nature, especially lizards and frogs. I got to know Guatemala with my grandfather, who took me to almost every corner of the country. Later on, I started hiking and climbing volcanoes, loving the contact with Nature and biodiversity. I always had an interest in science, trying to know how the Universe worked, to the point of considering Astronomy as a career, but that is a dead end in Guatemala. I was later interested in Biochemistry or Forensics, so I started studying Biochemistry at Universidad del Valle de Guatemala. After three semesters and coursing Ecology, I decided to be true to my inner child and I decided to switch to Biology. The most important decision in my life. I started pursuing my interests in Herpetology, Genetics and Conservation Biology, working with the endemic Heloderma charlesbogerti, an enormous venomous lizard [Real Scientists note: this is awesome] found only in the semi-arid regions of the country that is severely endangered. Afterwards, I started monitoring the impacts of high tension power lines in wildlife, especially on amphibian populations. Now, I’m working at the Center for Environmental and Biodiversity Studies at Universidad del Valle de Guatemala, helping with projects focused in water governance, biodiversity conservation, climate change mitigation and adaptation. First, I think that Conservation Biology is an urgent field of study that is vital to sustain human existence in the planet. Second, reptiles have been somewhat left out of the public preference and conservation efforts for them are extremely important. Third, I believe Conservation Biology can be a tool to build a better world, where life in all of its forms can thrive, reducing social inequality, providing resilience and better opportunities. Have you done any other sci-comm/outreach-type stuff? I try to do some sci-comm in my Twitter account mostly focused on creating empathy for not-so-charismatic species. I also write opinion columns in digital media about science and environmental issues. My ideal day off is in a lodge in the forest, where I can have a cup of hot chocolate and the go hiking and looking for reptiles and amphibians. Sergio Gonzáles, welcome to Real Scientists!